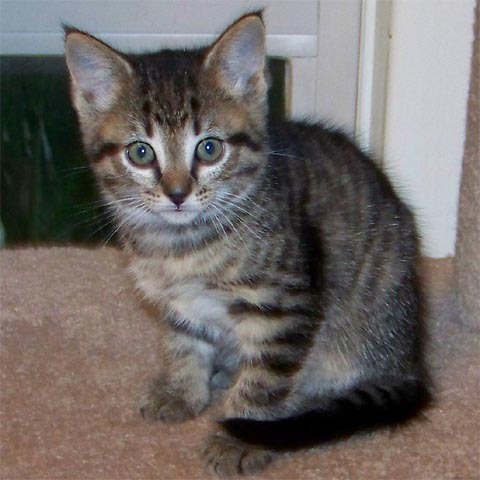 the smaller of two classic brown tabby girls, Daphne looked so much like her sister Hailey that the only way we could tell them apart for sure was by weight. Luckily Hailey always weighed several ounces more than her three sisters. In her first weeks at 50K, Daphne was the most social Eve, but she was gradually overtaken by Boxer. She was also one of the first to be weaned from the bottle, and the first to reach the top pods on the cat tree. She could usually be found doing pull-ups on the doorknob-hanging pad while her sisters played stringball. Daphne went home with Boxer to a young mom who fell for her when Daphne spent time in her lap at 50K. Her mom renamed her Alice.